Somehow the Choc Beer Company in my former home state of Oklahoma escaped my notice until this year, even though they've been selling beer in Oklahoma liquor stores since 2004. It's an embarrassing lapse on my part, because the family-owned business has been brewing legally in the small town of Krebs since 1995, and has a history of black-market brewing dating back 90 years. If I had known of all that, I would never have called Oklahoma "zymurgically challenged". 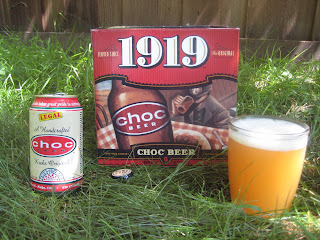 Last weekend I was visiting my family in Tulsa, so I checked out a couple of Choc beers: the "original family recipe", marketed under the name 1919; and a new Kolsch called Spahnie 363, named after Milwaukee Braves pitcher Warren Spahn, who retired to Oklahoma. The 1919 is made with part barley and part wheat, and might not be the exact recipe handed down from Grandpa, seeing as how its ingredients include Hefeweizen yeast and Cascade hops. Nevertheless, it is a nice, refreshing brew, very satisfyingly full-bodied for its 4% ABV. Naturally it calls to mind Widmer Hef, but it's perhaps slightly more esthery than Widmer, and a little darker in color. Kind of a grainy finish, not in a bad way. The Kolsch was also nice, right on the money for the style: light and crisp, slightly citrusy. If I had had my wits about me, I would have tried some of the other Choc offerings. For such a small concern, they bottle a lot of styles: a pale ale, a schwarzbier, a Belgian dubbel, a German hefeweizen, and a few others. Choc's history is ready-made for a National Public Radio feature. It all started in a 1920's Italian restaurant called Pete's Place. Krebs was a coal-mining town, and after Italian immigrant Pete Prichard -- he anglicized his name from its original Pietro Piegari -- was injured in a mining accident, he opened a restaurant. 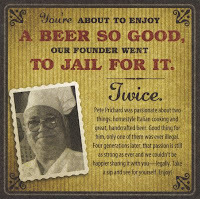 Even though Prohibition was in effect, Pete served homebrewed beer made with a Choctaw Indian recipe. Homemade, untaxed Choc beer continued to be served at Pete's Place -- with a nod and a wink from the local authorities -- until 1981, though Pete apparently did serve some time for his brewing activities. In 1995, his grandson Joe restarted the brewing operation -- legally, now that brewpubs had been legalized in the Sooner State. The brewmaster is a longtime employee of the restaurant who got interested in the modern style of homebrewing and even took some classes at Siebel. Today's Choc is a really interesting endeavor. They're marketing their historical roots, but making serious beer in a variety of interesting styles. The beers are bottle-conditioned -- or can-conditioned in the case of the canned 1919 -- something that seems very advanced for a small brewery in a small town in a state that isn't a great microbrew market. They also sell in Kansas and Arkansas, and they're marketing the Kolsch in Wisconsin (Spahnie for the Sconnies). I can't help but think they're trying to pull a Shiner: use a small-town historical angle to get attention and sell lighter, more accessible beers, but keep the brewmaster happy with a line of more interesting styles. If you're in that part of the country, pick up some Choc. It's good beer with a great story. Be sure to give the Dubbel, Bière De Garde, and Waving Wheat a shot if you ever get the chance, these are my 3 favorite! Thanks, Chris! It was such a short trip for me that I counted myself lucky to try a couple Chocs (I also had to check out the Shiner special releases since we don't get Shiner up here). I'll look for the more out-there Chocs next time!